Jack McClure and Alli Carson are back in the most recent installment of Eric Van Lustbader's McClure-Carson series. This time, Alli is charged with murder, and Jack is put on a mission to assassinate an Albanian crime lord who is becoming too powerful. Soon they come together and find themselves in the middle of an international slave trade and a plot in which Alli's billionaire uncle and the President of the United States himself are somehow involved. 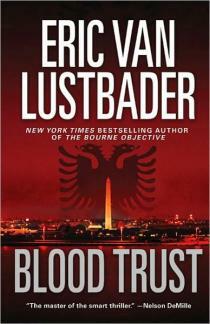 Blood Trust is the third book in the McClure-Carson series. I read and reviewed the first two, First Daughter and Last Snow, last year (click on the titles to see my reviews) and was very excited to read this next book in the series. Blood Trust continues the saga of Jack McClure, National Security Adviser who uses his dyslexia to solve crimes in a unique way, and Alli Carson, the daughter of the former US President who is still trying to move past her kidnapping back in First Daughter. There's plenty of action as Jack and Alli work to stop the slave trade, assassinate the crime lord and figure out who is framing her for murder. Other characters from the series return, and Van Lustbader digs deeper into their characterization. Emma, Jack's dead daughter, is still "speaking" to him from the beyond, helping him through some tough times. At times, it was a little hard to follow the storyline with all the twists and turns, but in the end it all comes together in a way I hadn't quite expected. Although Van Lustbader spends a little time mentioning some of the events from the first two books that figure prominently in this story, I do think it would be better to read the first two books before Blood Trust. Some parts of the storyline and character development are really extensions from the previous books. Overall, it's a great thriller and will definitely appeal to fans of Van Lustbader. This review was written based on a copy of Blood Trust that I received from AuthorsOnTheWeb in exchange for an honest review. I enjoyed your review and would love to read these three titles :) *Thanks* for the giveaway! sounds like some great reads! Thanks for a chance at a super giveaway! Just wanted to let you know I received Blood Trust and First Daughter today -- I'm still waiting on Last Snow :) Many thanks again!